The world crisis which has produced enormous economic devastation in the financial sector and the real economy in the last few years has not finished inflicting its evil consequences on the international proletariat. The economy is not reviving, unemployment is increasing, and with unemployment, so is job insecurity. The young are hit most and in the most serious cases almost half sit at home whilst the others fight for temporary jobs at starvation wages. Investment is not taking off, the profits crisis and the low rate of profit continue to stimulate speculation on the raw materials markets - headed by oil - but particularly cereals like wheat with the inevitable consequence of an increase in prices of basic goods. In the case of less developed countries these have been at the root of the recent impoverishment of growing masses of working class families, despite the recent bread revolts. The welfare state - where it exists or used to exist - continues to be progressively dismantled making access to school, healthcare, pensions, and unemployment benefit more difficult. The poor, who swell the ranks of the dispossessed have to survive, somehow or other, below the poverty threshold. The rich capitalist countries are no longer able to guarantee what they could before to the workers but are forced to reduce wages, jobs and welfare. In the less developed countries the wave of crisis is generating in the very same geographical area, at the very same time and with the same intensity, a once in a lifetime rebellion against hunger and poverty. The most tragic effect of this is the exodus of hundreds of thousands of refugees who desperately try to escape unemployment which has reached unbearable levels, the widening poverty and civil wars which inevitably flare up like tinder at the first spark in situations like this. It is a migration which drives the workers from the poorest capitalist areas towards the richest even if they are also prey to the very same crisis and therefore getting poorer. They flee, carrying the burden of so many false illusions, and the sure and certain fate of being rejected and obliged to submit to the most degrading exploitation in the fields, harvesting tomatoes and potatoes, without lodgings, without welfare, living like animals in captivity. That’s if all goes well, otherwise they find their tomb on the open sea before the end of their voyage. The crisis we are witnessing in the early years of this millennium is characterised by permanent wars, civil wars both latent and actual, inter-bourgeois faction fights and imperialist conflicts in every corner. First in Afghanistan and Iraq, next in the Maghreb and the Middle East, including the Arabian peninsula, then in Sudan, Chad, Mali and the Ivory Coast. This is capitalism the profit machine, the instrument of exploitation, the producer of misery and war in order to maintain itself as the dominant economic form to the advantage of the ruling class. Never before has the slogan “Workers of the World unite” been so vital and necessary as in this period. The workers of the Maghreb have to struggle against their respective corrupt and dictatorialruling classes who have reduced them to starvation. 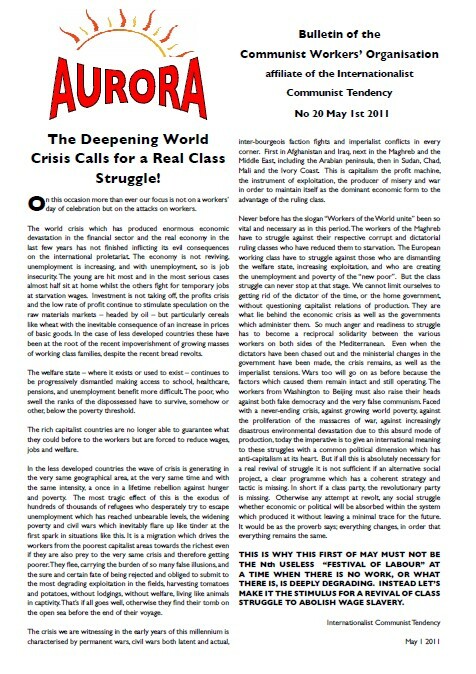 The Europeanworking class have to struggle against those who are dismantling the welfare state, increasing exploitation, and who are creating the unemployment and poverty of the “new poor”. But the class struggle can never stop at that stage. We cannot limit ourselves to getting rid of the dictator of the time, or the home government, without questioning capitalist relations of production. They are what lie behind the economic crisis as well as the governments which administer them. So much anger and readiness to struggle has to become a reciprocal solidarity between the various workers on both sides of the Mediterranean. Even when the dictators have been chased out and the ministerial changes in the government have been made, the crisis remains, as well as the imperialist tensions. Wars too will go on as before because the factors which caused them remain intact and still operating. The workers from Washington to Beijing must also raise their heads against both fake democracy and the very false communism. 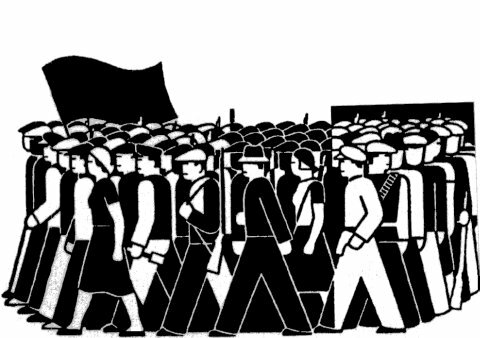 Faced with a never-ending crisis, against growing world poverty, against the proliferation of the massacres of war, against increasingly disastrous environmental devastation due to this absurd mode of production, today the imperative is to give an international meaning to these struggles with a common political dimension which has anti-capitalism at its heart. But if all this is absolutely necessary for a real revival of struggle it is not sufficient if an alternative social project, a clear programme which has a coherent strategy and tactic is missing. In short if a class party, the revolutionary party is missing. Otherwise any attempt at revolt, any social struggle whether economic or political will be absorbed within the system which produced it without leaving a minimal trace for the future. It would be as the proverb says; everything changes, in order that everything remains the same. This is why this first of may must not be the nth useless “festival of labour” at a time when there is no work, or what there is, is deeply degrading. Instead let’s make it the stimulus for a revival of class struggle to abolish wage slavery. Given the excellence and compelling brevity of so many of the documents on your website, and your ability to lay bare the effects of the absurd mode of production we live under, I was wondering what sort of readership you have and how extensive it is. There must be many workers out there who are just dying to hear what you are saying. Who would immediately grasp what you are saying, and find it a huge relief to to hear at last what they are feeling inside: that this system is the root of all that is bad and inhuman, and that we, the working class are the ones who can get rid of it. And that all we need to do is to acknowledge this together, in communal solidarity, and just do it. Let's not be shy and timid about this. Let's revive the class struggle to abolish wage slavery.